Balkonda, also referred to as Allakonda, comprises of 36 villages. Armur and Nirmal are the nearest towns to Balkonda. Sunrise timings in Balkonda varies 16 minutes from IST (Indian Standard Time). The headquarters of Balkonda Mandal is Balkonda town. It is situated about 40 kms. from Nizamabad. Towards the South of Balkonda Mandal lie Armur Mandal and Velpur Mandal while Mortad Mandal and Kammarapalle Mandal are situated towards the East. Nizamabad is an important city near Balkonda. Argul Rajaram is a famous name here who was considered as the champion of backward classes. Kakatiya and Lakshmi canals, bore wells, agricultural wells and lakes are the main water sources for cultivation in Balkonda Mandal. Sriram Sagar Project reservoir has been built on Godavari river at Pochampad. It comprises of 42 gates and has a depth of 1,091 ft (333 m). Major villages near Balkonda are Mendora, Kissannagar, Pochampad, Kothapally, Renjarlla (8 kms. ), Mupkal (5 kms. ), Bussapur (3 kms. ), Elkatur, Chittapur (3 kms. ), Doodgaon (13 kms. ), Soanpet (10 kms.) Jalalpur, Srirampoor (10 kms. ), Venchiryal (10 kms. ), Kisan nagar (2 kms. ), Nalloor (7 kms. ), Mendora (11 kms. ), Velkatoor (11 kms. ), Chakiryal (14 kms. ), Savel (14 kms.) and Vannel-B (5 kms.). Kodecherla is the smallest and Balkonda is the biggest village. The winner of Balkonda Assembly Constituency is Vemula Prashanth Reddy (TRS-Telangana Rastra Samiti party). Balkonda is an Assembly Constituency. Sirpur in Chattisgarh (via NH-7): 650 kms. People residing in Balkonda speak Telugu language. They also speak Urdu and English here. Summers are too hot here and they dress accordingly in cotton clothes to remain comfortable. Male members wear Uttareeyam or Pai Pancha (Angavastram or veil), Pancha (Dhoti), Jubba (Kurta) and lungi which is a casual dress. Women wear Cheera (sari) while young girls wear Langa Oni (Half sari) and Parikini. People residing in Balkonda relish rotis prepared using millet. These include jonna rotte (sorghum), sajja rotte (penisetum), or Uppudi Pindi (broken rice). Gravy or curry is known as Koora and Pulusu (Sour) in based on Tamarind. Well, they love to eat red hot flavoured food! Boti and Thunti Koora are prepared of red sorrel leaves. Potlakaya pulusu or Snake gourd stew is eaten nearly everyday! Kodi pulusu and Mamsam (meat) vepudu are popular non-vegetarian (meat) dishes. Important festivals celebrated by people are Makar Sankranti (in January), Maha Shivaratri (in February/March), ugadi or Telugu New Year (in March/April), Sri Ram Navami celebrated 9 days after Ugadi, Varalakshmi Vratam and Vinayaka Chaviti (in August), Dasara (in September/October etc. 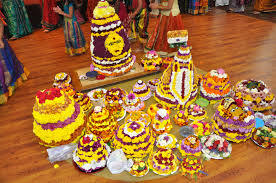 Bonalu celebrated in Ashada masam (July/August) and Bathukamma celebrated during Durga Navaratri for 9 days are state festivals of Telangana. Well, these festivals are celebrated with great pomp and show! There is no railway station in Balkonda. The nearest railway stations are Dichpalli Railway Station (32 kms. 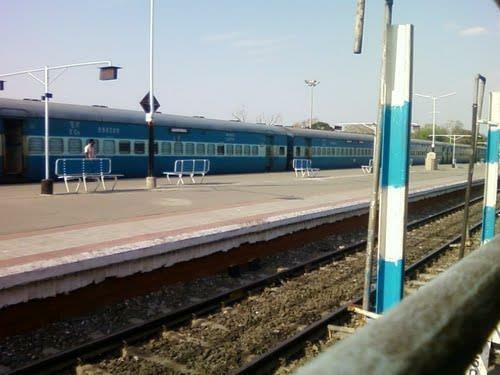 ), Jankampet Junction Railway Station and Nizamabad railway Station. A major railway station is Nanded Railway Station about 126 kms. from Balkonda. Balkonda is well connected with neighbouring cities by road. Nearest airport is Nizamabad Airport which is situated 34 kms. from here. PIN Codes of places in Balkonda Mandal are --- 503218 ( Kissannagar), 503217 (Balkonda), 503219 (Sriramsagar Project) and 503224 (Armoor). Balkonda is located 34 kms. from its district headquarters Nizamabad. 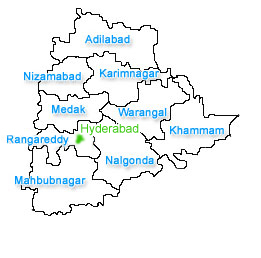 Nearby districts are Adilabad, Karimnagar, Nanded and Medak. Santha Mallanna Temple is a famous temple in Balkonda. Bangaru Venkateshwara Swamy Temple is also visited by a large number of devotees throughout the year. Other important temples in and around Balkonda are Sri Hanuman Temple in Velkatoor Village, Sri Venkateshwara Swamy temple in Velmal village and Sri Narasimha Swamy temple in Renjarala village. Adilabad (112 kms. ): Kuntala waterfalls, Kawal Wildlife Sanctuary, Pochera Waterfalls, Pranahita Wildlife Sanctuary, Mahatma Gandhi Park, Sivaram Wildlife Sanctuary, Kala Ashram and Basar Saraswathi Temple are interesting destinations indeed! Ramagundam (167 kms. ): NTPC Ramagundam and Thermal Power Plant are places of interest here. Hyderabad (195 kms. ): Durgam Cheruvu, St, Joseph's Cathedral, Legislative Assembly, Birla Planetarium, Indira Park etc. are tourist places you can visit here. Warangal (198 kms. ): Siddheswara temple, Kakatiya rock garden, Warangal fort, Musical garden, Khush mahal are some places worth visiting. Kurnool (429 kms. ): Mallikarjuna swamy temple, Kondareddy burz, Rollapadu wildlife sanctuary, Belum caves, Sakshi Ganapati temple will rejuvenate you to the hilt! Vijayawada (436 kms. ): Krishnaveni Mandapam, Mogalarajapuram caves, Kondapalli fort, Bhavani island are interesting sites for tourists. Adoni (497 kms. ): Kamam Bavi, Jumma masjid, Adoni fort, Ranamandala konda Sri mahayogi laxmamma, Avva temple are beautiful tourist sites you must surely take out time for visiting. Kothapally: There is an ancient Shiva Lingam in Rajarajeshvara Swami temple in Kothapally village. A large Uthsav (jathara) is organized during Maha Shivaratri festival. This village is also popular for 'Kabaddi' game in district. In Balkonda, agriculture is the primary source of income. Farmers in Balkonda mainly cultivate rice, turmeric (pasupu), corne (mokka jonna), pearl millet (sajja), and ground nuts. Turmeric fetches high prices for these farmers in the market. Normally, the turmeric season begins in the month of February and continues till May. Dwarka bazaar, Ankapur Market Yard, Satya Sai super market, Raithu Bazaar, Nizamabad Market yard, Cattle market yard, Iqbal Ahmed shopping complex are some bazaars and markets near Balkonda. Balkonda is stepping slowly but surely towards development and a better economy.